Will this exquisite crown be placed on Poland's head on November 14th? The second female Grand Slam winner of the 2017 season will be crowned in Japan on the 14th of November. 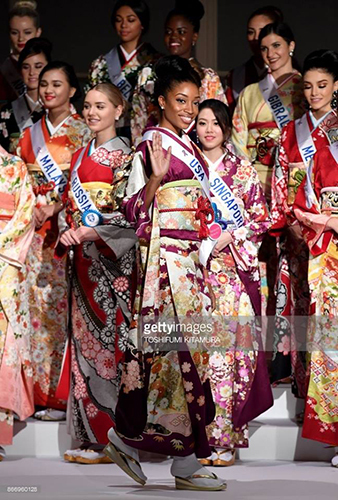 Approximately seventy young women from all over the world will spend the next fortnight in the Land of the Rising sun, where they will be competing to become the 57th Miss International. Most of the delegates have arrived in Tokyo and they have been visiting the sponsors of the pageant. The first stop was visiting the Mikimoto store in the famous Ginza shopping district where the Miss International crown is currently being displayed. The delegates were also treated to gift bags from Panasonic Beauty. Earlier today, the beauties were presented to the media in traditional Japanese kimonos.